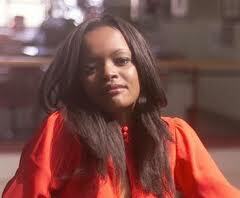 Nomakula Roberts famously known as Kuli Roberts, I personally think she's an intelligent woman. I love the fact that she speaks her mind akesabi nix. She makes such a good journalist. When I grow I want to be like her (LOL). So how do I know Kuli? I know she loves white men, yena and her sister Hlubi Mboya, that's one of the things the two siblings have in common. Not forgetting her controversial life. Kuli is well known for her big mouth. Remember earlier this year when she wrote a column in which she described colored women as beer - guzzling, chain smoking, and baby making factories with no front teeth that eat fish like they're trying to deplete the ocean (LMAO) asinqaba tu isgezo klosisi. She is the FACTORY yaso. Little did I know that nam uzondifumana on one of the social networks called twitter. I have been following her for quite a while, seeing her crazy joke tweets and all that. Till her "engrish" went wrong. This is what she tweeted "What's happening out their guys? Just finished shooting. Home time." And I underlined "their", knowing twitter or any other social network for that matter grammar or spelling errors are the order of them. And I understood it was a MISTAKE. So, I retweed and asked her "Their?" I repeated what she had typed but this time with a question mark asking her if she really meant that (LOL) and she replied "there. Sowi" and I replied and said to her "mistake" and even sent her a heart. Yhooo kanti ndiyibudile! She then responded again "u too perfect. Bye. Block" heee haibo Kuli nje kanjalo? I literally laughed out loud. I asked myself if that was necessary. Well was it? The answer is ofcourse NO. It’s not like I made fun of her and made her feel inferior because of her "English". She has issues, or let me rather say she might have probably had a bad day at the "shoot". Whatever the case I'm not going to beg her to unblock me. Umntu must be corrected xa ewrongo.